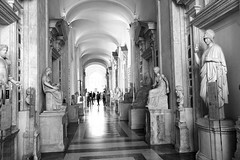 Inside the Capitoline Museums, Rome. I'd planned to have a regular style long annotation today, but I'm afraid the dreaded jetlag has defeated me, in combination with all the various other things one needs to do when returning home from a long trip. 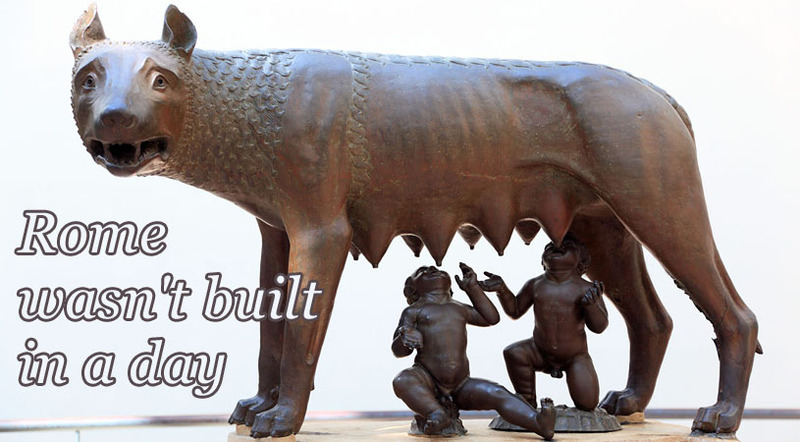 The above photo is of the Capitoline Wolf, one of the most iconic sculptures of... well, I would like to say antiquity, but recent work on dating the statue has thrown serious doubt on its traditionally reported origin as an Etruscan work of the 5th century BC. It now seems most likely that the wolf part of the statue was actually made in medieval times, around the 13th century. The suckling twin babies are in a completely different style and there is general agreement that they were added to the overall work in the 15th century, rather than being a part of the original wolf statue. They represent Romulus and Remus - according to myth the traditional founders of Rome, who as babies were abandoned to die in the wilderness but were found and suckled by a she-wolf before being taken in by the shepherd Faustulus and raised to manhood. This is one of the most famous legends of Roman mythology and is referenced all over the place. The statue is a symbol of Rome, and reproductions or images of it can be found in many places and contexts symbolising the city, as well as in many other places around the world merely as an art object or icon representing the concept of "founding of a city" in general. Marcus Aurelius. Bottom left is the Capitoline Wolf. Capitoline Museums, Rome. If you go to Rome and climb the Capitoline Hill for its view over the modern city and the view over the remains of the ancient Roman Forum, you will see the Capitoline Wolf mounted on a tall pedestal overlooking the Forum. While there recently, I saw many people gawking up at this statue and taking photos of it. But this too is only a reproduction. The original statue is displayed inside the adjacent Capitoline Museums, which many tourists to the city of Rome don't have the time or desire to go into. And it's displayed at eye level so you can get a much better view of it than the copy outside. Despite all of this, when I went to see it there were far fewer people looking at the original inside the museum than at the reproduction on the pillar outside. So I was able to get this photo with no people in the shot. There's another statue outside the Capitoline Museums - a magnificent bronze of the Roman Emperor Marcus Aurelius mounted on a horse. It dominates the piazza and is impossible to miss. Again, this is a reproduction, and the original bronze equestrian statue of Marcus Aurelius is inside the adjacent Capitoline Museums. 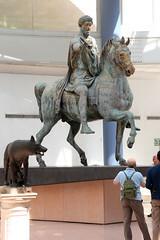 This statue is genuinely ancient, originally erected in 175 AD, and it is the only surviving bronze statue of a pre-Christian Roman Emperor (others were melted down either to reuse the metal or because they were unacceptably pagan to early Christians - this one reputedly survived only because people in the Middle Ages mistakenly thought it was the Christian Emperor Constantine). If I have a point to make today it's this: When you travel, don't just gawk at tourist attractions outdoors. Go into museums. Take a bit of time to learn more about the local culture and history. The rewards are worth it. In the Pantheon in Rome, I saw the tomb of Raphael. In the Capitoline Museums I saw a special display of documents from the Vatican archives. This included a letter to the Bishop of Cessna seeking assistance for workers who had been locked out of building the newly commissioned St Peter's Basilica following the death of the superintendent's patron, Pope Paul III. This letter was handwritten by that construction superintendent: Michelangelo. In Venice I visited a museum featuring working reconstructions of dozens of amazing inventions, built from engineering drawings by Leonardo. Also in Venice, while taking a vaporetto (water bus), I saw a poster advertising (in Italian) "All manufacturers! Great discounts!" The company being advertised was: Donatello Outlet. Last Modified: Sunday, 27 May 2012; 03:49:26 PST.